I wasn't going to be able to make it for the USK Cockatoo Island day yesterday so with the day off I had last week after Anzac Day, I made a solo trip over to make up for what I'll be missing! It was a beautiful, sunny day and I had the whole afternoon to just explore and sketch. 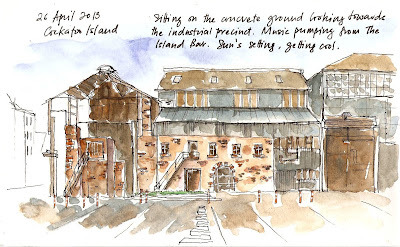 The first sketch was done standing on higher ground in a sandstone covering what used to be a military guardhouse looking out to the southern docks. What caught my eye was the unexpected red container next to all the browns and greys. 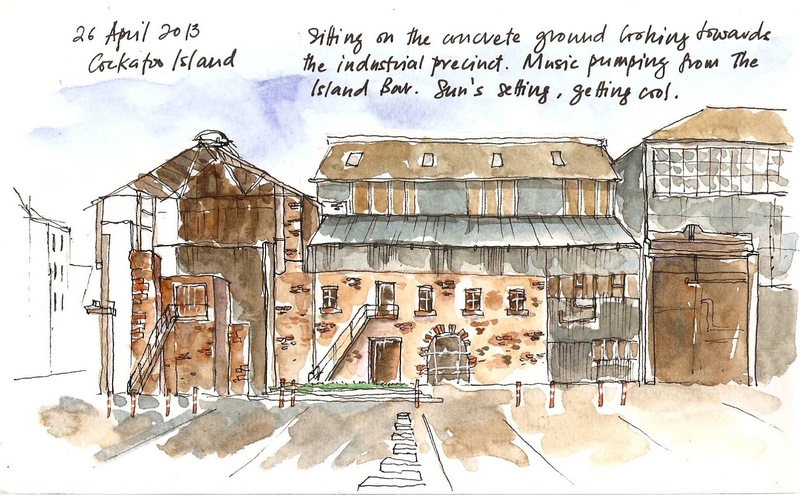 For the second sketch, I choose somewhere closer to the wharf so that I can keep on going right up to when the ferry comes. It was getting dark by the time I left. There were people getting off the ferry with pillows and eskies when I was boarding, probably heading to the camp site. Both sketches were done on location and colour applied at home.